Provide comfort for the family of Anita Moran with a meaningful gesture of sympathy. Don and I have fond memories of Aunt Babe and wanted to send our thoughts and prayers to our cousins and their families. Heartfelt Sympathies Store purchased flowers for the family of Anita Moran. We are so sorry for your loss. Our thoughts are with you and your family. 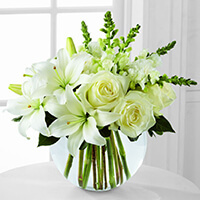 84.51 purchased the The FTD Special Blessings Bouquet for the family of Anita Moran. Mrs. Moran was the most beautiful person, inside and out, that I met on FB. I so enjoyed her interactions with her great grandchildren, whether singing to them or playing games! She was a joy to watch in the videos and I will miss her posts immensely. I am fortunate to have known her! My condolences to her whole family. You are in my thoughts and prayers. May God rest her soul.